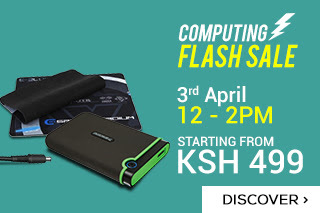 Easter comes early this year with Jumia Kenya bringing you a computing flash sale today between 12 and 2PM. Among the products on this huge offer are desk tops, laptops, printers & scanners, computing accessories and storage devices. Make sure to check out the Computing Flash sale page today to save before Easter.